The following is a good article I found by Curt Harler on Recycling Today Magazine. It's kind of long, but shows what uses the world has for palladium and the other PGMs. It also talks about prices per ounce of palladium and other metals and how 2008 was a roller coaster of a year. Good article. Enjoy! Harler's article begins by discussing how 2008 saw the price of palladium and other PGMs skyrocket; then plummet around 60% from their 2008 highs. Harler goes on to show what uses palladium, use platinum, and other PGMs throughout the world; and how the car industry effects a lot of things. 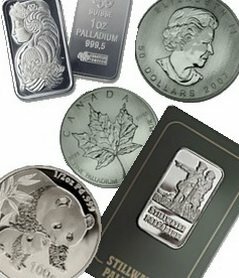 There aren't many palladium buy resources, or many sites to learn about palladium, but this article is a must read. And you don't have to pay to download it!